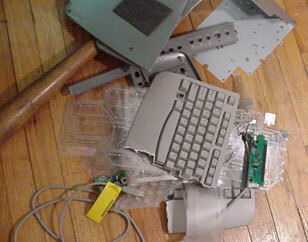 HP Keyboard - End of the World Production, LLC. 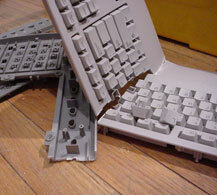 In this episode, we will be destroying an HP USB Keyboard. Not exactly sure of the model (it only has serial numbers on the back). 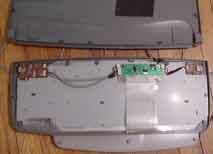 The keyboard originally came with an HP Pavilion PC, and was never used. 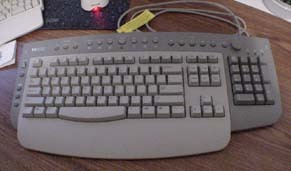 (was replaced on day one by a Microsoft Natural Keyboard). Looks innocent, doesn't it? But this demon can cause ergonomic injuries if used improperly [and properly, but they won't tell you that!]. Hmm... Is breaking it considered an improper use? 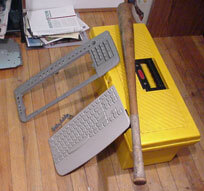 Anyway, I won't blame my arthritis on this keyboard since I've never used it... Whatever. This is a "Multimedia" keyboard, with all sorts of buttons (even for shopping! wow! 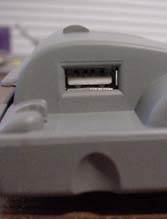 ), volume control, and even has two USB ports on the sides (probably to plug in the mouse we've totaled in the last episode). As we shall later see, this is the most screwy keyboard ever. 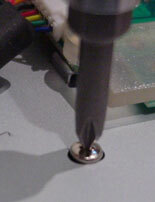 It took a good few minutes to take out dozens of these small screws that are holding this thing together. 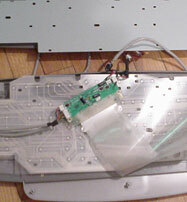 Once done, we can rip the keyboard apart. 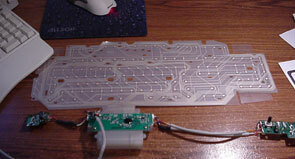 The whole keyboard is just one small main board connected to two USB collection circuits. It does, it does work! It's pretty tough to type though. 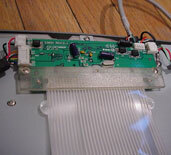 The plastic circuit is VERY sensitive. 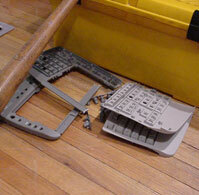 This keyboard is a bit different from all other keyboards (not only in that it has 60 screws holding it together). 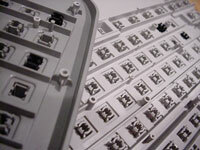 The individual keys are part of a lattice that holds all of them together, so even if you take the keyboard apart, they don't fall all over the place (unlike some older keyboards). Anyway, enough learning for one day. It's time for destruction. Well, not exactly BANG BANG BANG. 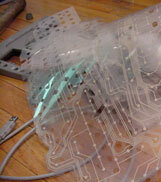 The plastic tended to bend rather than to break, so it was quite a challenge to get these pieces to actually break. This is for all the times you've ruined my Quake game!!! Anyway. That's it. Nothing more to break. We've reduced this wonder of technology into a pile of garbage.